As the Association of Southeast Asian Nations, or ASEAN, is set to become the fourth-largest market after the European Union, United States and China by 2030, Russia is trying to get its act together and position itself as a top trade partner and destination for investments. This could expand the China-U.S.-ASEAN trio into a quartet if Russia joins, but that would mean a long and uphill battle. The charm offensive undertaken by Russian Foreign Minister Sergei Lavrov at the 48th ASEAN Foreign Ministers’ Meeting (AMM) held in Kuala Lumpur from August 1 to 6 is testimony that Moscow is determined to reap every benefit from the long-term strategy of a “pivot to Asia” it has adopted in the face of the sanctions imposed on it by the West over Russia’s role in Ukraine. Until recently, the ASEAN did not feature prominently in the upper half of the Russian priority list of trading and economic partners. Trade turnover has reached a modest level of $21 billion, although it is gaining momentum: A few years ago the figure was much lower. Still, Russia is now among the ASEAN’s top 10 trading partners. A special joint committee on economic, scientific and technical cooperation is expected to be set up later in August while, concurrently, a delegation of Russian entrepreneurs representing 20 companies will be talking with their counterparts in Malaysia and Brunei on potential interaction in fields such as oil exploration and production, agricultural-based businesses, IT technologies, and transportation. The Asia-Pacific Region is currently witnessing the development of a rivalry, with strong geopolitical overtones, between China and the U.S. Washington has urged Beijing, which is involved in territorial disputes in the South China Sea, to introduce a moratorium on any activities on all of the islands that are a bone of contention between China, Japan, Vietnam, Malaysia, Taiwan, Brunei and the Philippines. Beijing has defied this demand, stating that players from outside the region have no right to meddle in the internal affairs of Asian nations. Moscow is well aware of the investment potential of the steadily growing economies of the ASEAN, and would like to capitalize on its geographical proximity by inviting local entrepreneurs to make commitments to the various projects in the Russian Far East. The offer to make use of the Vladivostok free port zone as a transcontinental hub is the proverbial cherry on the top. Gleb Ivashentsov, a former ambassador and now member of the Russian International Affairs Council, has been named one of the “council of the wise” formed to promote a Russia-ASEAN dialogue. Some analysts say Russia has been lagging behind other major nations and it has missed many opportunities in Southeast Asia, with the ASEAN being the arena of competition between China and the U.S.
“Asia has a polycentric configuration. We should talk not only about China, the United States and the ASEAN, but also about Russia and Japan. It is much bigger than a triangle,” he said. 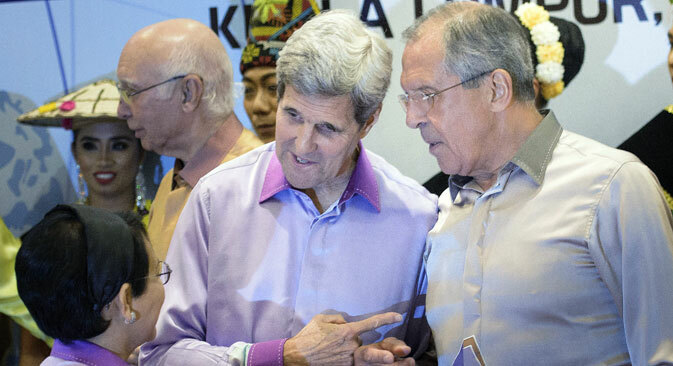 “I think Russia will play a significant role in Southeast Asia. There is a memory in Southeast Asia of Russia supporting national liberation movements in Vietnam, in Indonesia, and some other countries.The rise of Russia as a new modern state will bring new possibilities for economic, scientific technological and energy cooperation with Southeast Asia,” Ivashentsov said. However, this upbeat assessment is disputed by Dmitry Mosyakov, an expert in regional affairs and deputy director of the Institute of Oriental Studies at the Russian Academy of Sciences. Mosyakov rules out the chances of the existing China-ASEAN-U.S. triangle being transformed by the addition of Russia. “Russia has not taken sides in the territorial disputes in the South China Sea. Moscow distances itself from this controversy for fear of alienating its partners, be it Vietnam or China. On top of this, Moscow is used to developing substantial cooperation not with ASEAN as an alliance but with separate countries on a bilateral basis,” Mosyakov said. In this case, would any other country, apart from Vietnam, care to establish privileged relations with the Eurasian Economic Union? Ivashentsov believes this is possible, placing the emphasis not only on the provision of energy or sales of military hardware, but on the flow of capital and joint production.